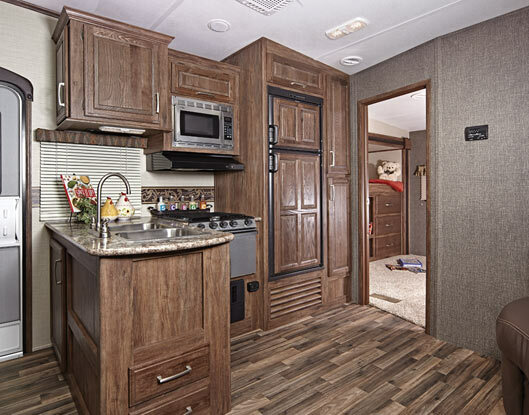 With its sleek body and spacious interior, the 2015 Keystone RV Cougar X-Lite Fifth Wheels are a combination of beauty, elegance and towability with kitchens that really cook, magnificent master suites, full-sized slide outs, and bunkhouse models that can sleep up to nine people. A powerhouse lite weight fifth wheel that promises a sturdy ride and amazing comfort.With a variety if floor plans to choose from there is a Cougar for you. Heading into the galley of the Cougar X-Lites, you’ll find a living space decked out in a tasteful decor and plush bonded leather sofas. The kitchen is ready to serve with a three burner range, microwave, double sink, and Dometic fridge. Set in hand-glazed hardwood cabinetry, the kitchen is beautiful with just the right touches of practicality. Love to cook, but the weather outside is just irresistible? On some Cougar X-Lite fifth wheels an outdoor kitchen is an option. When it’s time to kick back and relax, take your pick of the ample seating throughout the Cougar X-Lite. Or, head to the front bedroom where you’ll find a plush queen-sized bed. With its full wardrobe and timeless decor, the bedroom is the perfect retreat after a day on the road. With the space to sleep nine, this fifth wheel is the perfect choice for families. A rear bunkhouse provides a fun space for kids to relax during the day and provides extra sleeping space at night. While we would love for RVing to be a fun, every once in awhile we have to stop and do a little work. And with a fresh water capacity of 43 gallons, grey water capacity of 56 gallons and black water capacity of 28 gallons, you can travel more and stop less. Equipped with a smoke detector, carbon monoxide and LP detector and a fire extinguisher, the Cougar X-Lite Fifth Wheels have the features to ensure you and your family a safe trip. 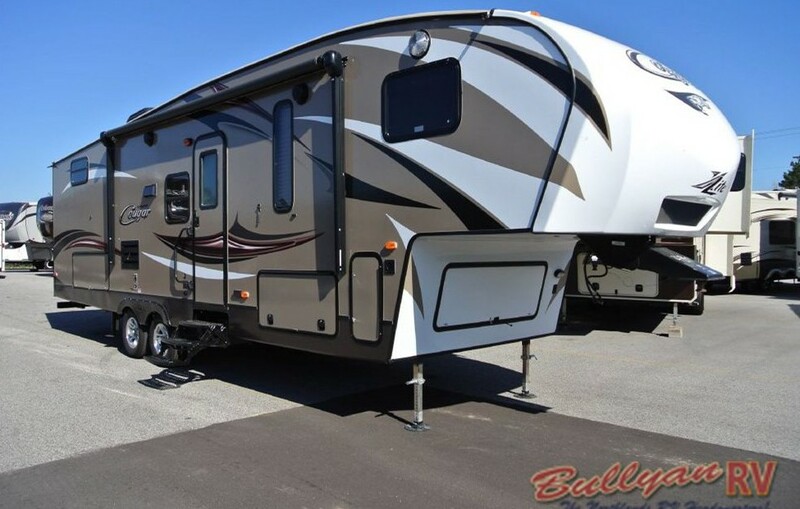 Ready to see for yourself all the features packed into these beautiful fifth wheels? Visit us today and our friendly staff will show you around.